Though painted in 1892, Gibbs looks back the time of the French presence in Michigan in 1670. The French worked peacefully with the Indians and provided them with firearms in which enabled the Indians to have a distinct advantage over others who did not have them. This dependence on European goods and firearms contributed to the eventual loss of Indian autonomy. In this coexistence, the Indians fought on the side of the French and helped them establish key points at the mouths of Lake Superior and Lake Michigan. Louis XIV sent missionaries and traders to meet with an assembly of Indians at Sault Ste. Marie and in June 1761 took possession of the Great Lakes and lands beyond. In 1673, Father Marquette and Louis Jolliet left St. Ignace and began their voyage to the Mississippi River. 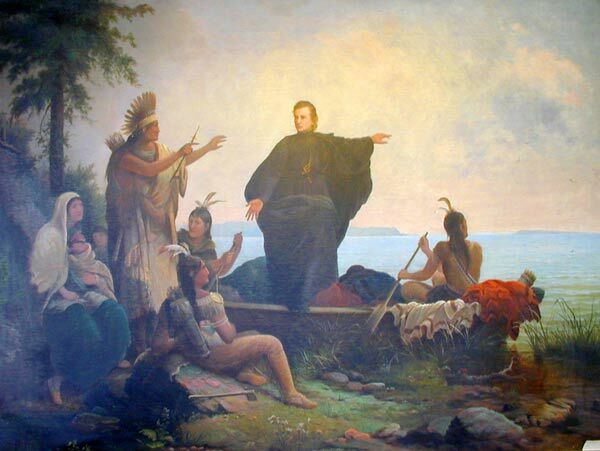 This painting shows Father Marquette extending a noble gesture to the peaceful Indians who also gaze in the direction of the extended left hand. The almost triangular composition combined with the noble gesture of the Christ-like Father Marquette contribute to a strong classicism of the work. The Indians are at peace, the standing chief on the left holds a peace pipe and reinforces the pointing direction towards the upper right which is filled with light-colored clouds expressing the optimism of the future. As if to complete this “religious” scene, the maiden holding a child and seated in front of a primitive structure is strongly suggestive of the Mary and Christ child theme. Even the blue of her gown is the symbolic blue of the Madonna. In this single painting of a historical event, Gibbs has brought the primitive Indian into the world of enlightenment of the Christian religion. 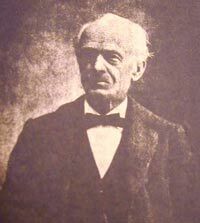 Just as the artist in 1906 was described as being one who went through life like one led by high and lofty ideals (Dwight N. Lowell, Sketch of William Woodruff Gibbs, Historical Collections, Michigan Pioneer and Historical Society, 30, p. 304), so, too, is this painting noble and idealistic. Your internet directory for the beautiful Upper Peninsula of Michigan!